Observing the Super Blood Wolf Moon. Keeping it simple for the January 2019 Lunar Eclipse. Yeehaw! The skies have remained clear this evening and things are looking great for tonight’s total lunar eclipse. What a difference that makes to the total washout we had here for the last one, which occurred on the evening of July 27 2018! Okeydokey. What exactly is a Super Blood Wolf Moon? It’s a Super Moon because the event occurs when the Moon is significantly closer to us than normal, making our natural satellite bigger and brighter than at other times. It will be a Wolf Moon as it simply denotes a full Moon in January. The connection with wolves is a little harder to pin down, as these largely nocturnal critters are often heard howling at night and often in the direction of the Moon. Finally, a Blood Moon indicates the coppery colour the Moon turns in mid-eclipse as it enters the Earth’s shadow, when sunlight gets refracted (bent) as it passes through its atmosphere, casting an eerie ruddy hue on the lunar surface. Dry, no wind, very cold, 0 C, a wee bit hazy, reducing transparency just a tad. Moon currently transiting the meridian. Instrument used: 10 x 50 roof prism binocular mounted on a monopod for additional stability and comfortable viewing. Binoculars were made for watching the full Moon, an activity I’ve been enjoying these last few months. I don’t normally observe the Moon when it’s full but binoculars have made it a very worthwhile exercise, especially on nights when some cloud banks cover it. Refraction of Moonrays often produces wonderful displays of colour which are thrilling to observe with ordinary binoculars. My family will join me later during mid-eclipse. 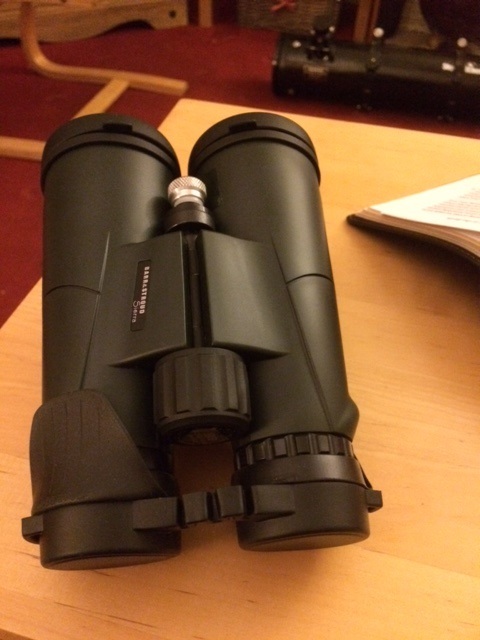 My wife will likely reach for her compact 8 x 25 Opticron LEs and the boys will likely be making use of my general purpose, 8 x 42 wide-angle roof prism binocular. 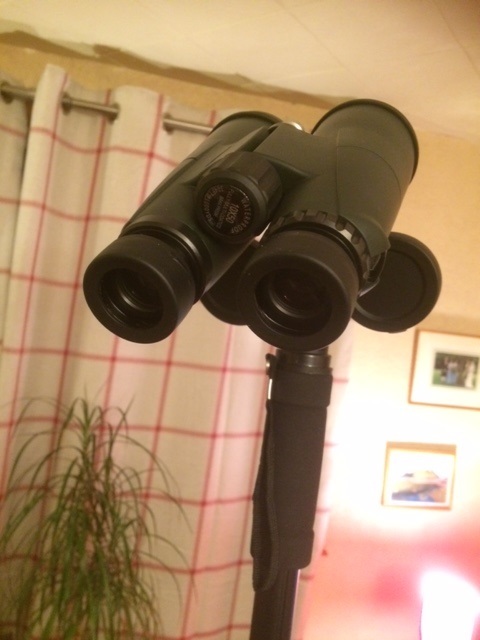 The author’s 10 x 50 binos atop a lightweight monopod. 10 x 50 binoculars are ideal for watching lunar eclipses as they offer decent image scale and a wide field of view for observing stars in the vicinity of the phenomenon. I hope to estimate the brightness of the mid-eclipse Moon by turning the binocular around and looking through the objective lenses. This reduces the size of the Moon to something much more like a bright star and so is a useful and simple way to compare it to familiar bright winter stars. L=0 denoting a very dark eclipse, with the Moon almost invisible at mid totality. L= 1 denoting a dark eclipse, with grey or brownish colourations but with lunar details only discerned with difficulty. L= 2 denoting a deep red or rusty colouration, with a darker central area and progressively brighter near the lunar edges. L= 3 denoting a brighter, redder eclipse often with yellowish colours appearing near the edge. L= 4 denoting the very brightest eclipse, when the Moon is a coppery red colour, often occurring with prominent bluish shadow rims. Conditions remaining good as the eclipse begins. Moon now high in the western sky, a light easterly breeze has started up, bringing some sparse cloud with it. Arcturus rising in the eastern sky; Capella sinking in the west. Partial eclipse now underway; darkening of the limb clearly visible. Thin cloud has moved in and the breeze is still here but lunar visibility still fair to good. Moon looks like the Deathstar out of Starwars through the 8 x 25 compact. Some faster moving cloud has rolled in. Amazing display from the clouds in colour and in texture as they move across the face. Coppery glows readily seen now. Time to wake the troops. Just a few minutes from maximum eclipse. Visibility now very poor, looks like a L=1, but there is also significantly thicker cloud cover. No stars visible for brightness estimate. Prominent coppery tones from southern hemisphere, brighter near northern limb. Lunar regolith pretty difficult to discern. Visibility quite poor. Postscript: Thoroughly enjoyed the long build up. But as mid-totality approached, the clouds had built up to such an extent that the Moon could only be seen intermittently. The boys found the eclipsed Moon to be quite eerie looking but seeing it well in binoculars or using the naked eye was always interrupted by the encroach of cloud from the west. This cloud formed the basis of a weather system which caused it to rain for most of the day yesterday. My wife thought the event was cool but, like me, she felt that she had witnessed better lunar eclipses in the past. The apperance of the eclipsed moon looked very much this fine depiction created by veteran sky watcher, David Gray, who is based just a few hundred miles south of our location, only that the details on the lunar regolith were far more subdued owing to the smaller apertures (50mm in our case) employed. Following your exploits from the deep southern US. Hope you got a good view of the eclipse. It was very dark and subdued here. As a visual spectacle I’ve seen better.